So cool you'll forget it's a tool, this bracelet lets you make a battery pit stop without stopping. Your nephew flew across five states to visit, and boy is he cute. Moments you want to capture: 987. The charge in your phone battery: 0. Luckily, you're wearing your Phone Charging Bracelet. With its lightweight, minimalist styling and polished metallic shine, it’s so cool you forgot it was a tool. You juiced up its rechargeable lithium battery two months ago, and the hidden LED indicators say it’s still charged. 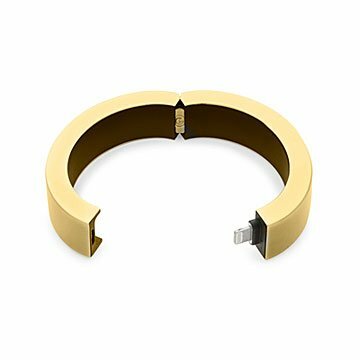 Slip off the bangle, insert the hidden Lightning Connector into your iPhone, and charge it up to 50% (depending on the model) in just 40 minutes. After you've distracted him awhile with candy (his parents don't need to know), it's time to record that joyful sugar high before he crashes. Designed in New York City. Made in China. 3.5" L x 0.75" W x 2.75" H, Inner Circumference: 7.1"
Clean with cloth; do not apply pressure on connector. My boss LOVED this. She is on the phone all the time and i noticed she always was carrying cords and stuff and plugging her phone in. This made it super easy! She used it the 1st night at a business dinner when her phone was going dead It provides a 50% charge so you can finish that business deal AND still catch a Lyft home! I wore this bracelet for 2 weeks straight on vacation. Always was able to charge my phone when needed. Elegant way to solve a previous difficulty. I could not be more pleased!!! Only now I need to purchase several more as gifts!!!! This is awesome. I bought it for my sister-in-law, but ended up getting one for me too. It is so nice to have an extra "battery" on you. Not in your purse or in the car, but actually on you.